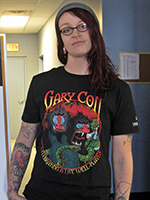 BACK BY POPULAR DEMAND- Gary Con Demogorgan shirts! How will the world know how awesome you are to be part of the Gary Con family unless you show it? Grab your Demo Gorgon shirts NOW in long or short sleeves. Ordering now saves you from items being sold out, or waiting in line at the convention.